This match was the league decider as both sides were unbeaten. Ellerslie on the back of recently winning the 8 a-side Nottingham U13 League had an air of confidence as Belvoir batted first. Liam Tew and Tommy Bealby opened the innings facing a mix of pace and spin which was met with a high level of maturity. Both batsmen treating the quality bowling with respect and punishing the loose deliveries. On a fast BCG outfield Liam and Tommy constantly challenged the fielders converting singles into 2s and 2s into 3s. Liam retired 38 not out (hitting seven 4s) closely followed by Tommy retired not out 38 (hitting four 4s). Having built a fantastic base (at times Belvoir were standing at 9 an over) Will Creed and Sammy Hardy continued to punish the bowlers and the fielders! Will finished 35 not out (three 4s) and Sammy 16 not out (one 4). Belvoir finished 155 for 0 from 18 overs. A commanding total against a very good side – our highest total this season. Aggressive bowling from the start added to a willingness to chase every ball put Ellerslie behind the required rate from the off! Liam followed up his batting performance with 2 for 15 aided by Oliver Poole 1 for 17. Jack Hall continued to apply the pressure 2 for 2 in tandem with Jonathan Hedley 1 for 13 (good catch Kyle). Sammy then joined in the wicket taking – 2 for 2 along with Kyle Polzin (1 for 4 – good catch Jack). And so it was left to Dan Wade – 2 balls : 1 wicket (calm slip catch Liam) – to leave Ellerslie all out for 84 in the 17th over. 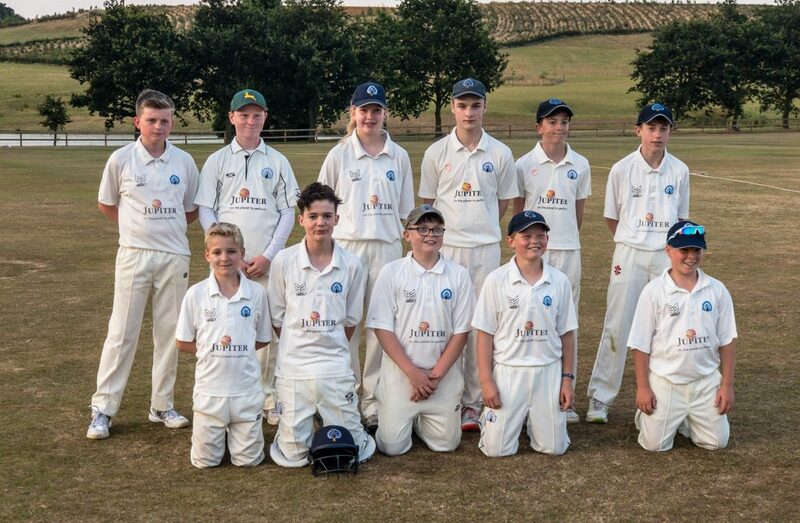 Belvoir U13s are the Newark South Division winners and have the play off final against the Newark North Division winners to look forward to in September at the BCG (and a Cup semi final next week against Ellerslie!). Well done boys and girls – a league season for you all to be proud of with everyone contributing. The support which our players give their team mates when things do not always go well coupled with delight in their successes puts this team above their opponents. This has built confidence and allowed us to win some close games which may have not gone our way if the players do not feel supported by their team mates. Keep working hard in training – just a few games to go.